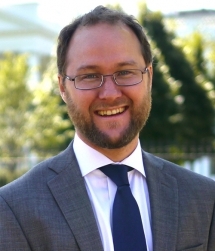 Dave Wilkinson, who served as a Jane Addams Fellow at the Lilly Family School of Philanthropy, has been named Director of the White House Office of Social Innovation and Civic Participation. Under Wilkinson's leadership the Office will be focused on strengthening communities and enabling upward economic mobility by finding and growing approaches that work best for communities in need, according to a White House announcement of the appointment. This involves identifying programs that work better through use of data and evidence as well as scaling what works through smarter use of federal resources and public-private partnerships. Using the tools of evidence-based policy, philanthropy, and impact finance, Wilkinson leads an Office of Social Innovation that supports the development and launch of data-driven solutions across a range of domestic policy priorities from education and job growth to economic development and healthy communities. In addition, he coordinates efforts to attract and deploy America’s talent, from national service and volunteerism to employing better management strategy, in support of effective community solutions. Wilkinson draws from an extensive background in impact finance, social entrepreneurship, evidence-based policy and organization management. He previously served the White House as Senior Policy Advisor for Social Finance and Innovation, assigned to the Office of Social Innovation and the White House Council on Environmental Quality. For the Office of Social Innovation, he led a range of initiatives including Pay for Success, evidence-based policy, and impact finance. At CEQ, Wilkinson served as the lead for green finance. His work spanned CEQ’s portfolio, with a focus on market development, financial innovation and ladders to economic opportunity as they connect to infrastructure, water resources, climate resilience and renewable energy. Prior to his roles at the White House, Wilkinson served as Executive Director of City First Enterprises, a federally regulated nonprofit bank holding company and incubator of social finance solutions. At City First, he designed and directed new initiatives in community development finance, helping to create jobs and stabilize vulnerable communities. He led the development, financial structuring and launch of innovative solutions in impact investing, affordable housing and community facilities finance, small business and nonprofit lending, and community crowdfunding. Mr. Wilkinson previously co-founded and helped lead a successful effort to launch a start-up community development bank in New Haven, CT. He also served as Executive Director of Common Cause New Jersey, an 8,000-member organization that fostered local civic engagement, helping citizens pass laws in over 100 municipalities and launching a new high school civics curriculum. Mr. Wilkinson has served on the board of the City First Foundation where he was a founding director. He was selected by Next American City Magazine as a member of its Next American Vanguard, an annual “40 under 40” award honoring urban innovators. He is a graduate of the University of Virginia and Yale Law School.